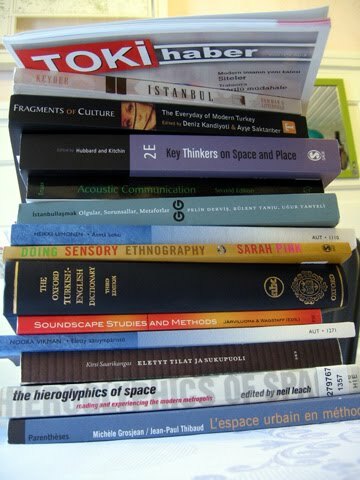 I'm in a middle of a writing period and here's my literary companions for the next fortnight: some urban studies, a little bit of methodology, a reader, a newsjournal, two dictionaries and a bundle of soundscape studies. The rest of my desk space is flooded by field diaries and note books, mind maps, copies of Turkish housing laws and interview transcriptions. If my mind will stay clear and moods high I'll soon have a manuscript ready of an article about housing cooperative Ata-2 and auditory culture in Cengelköy, Istanbul. Wish me luck.